In honor of Women’s History Month, Clark Partington offers a mini-series focused on inspirational women. The featured quotes and the women who spoke them have had an impact on the authors of these blogs. In each blog, you will get to know the influential women in history, as well as two Clark Partington attorneys. This second blog was authored by Megan Fry as part two of a mini-series focused on inspiring women leaders. We hope you will be inspired, too! Born in 1924 in Brooklyn, New York, Shirley Chisholm made history in 1968, becoming the first African American woman elected to the US Congress. During her time in Congress, she helped pass legislation extending unemployment benefits to domestic workers, providing daycare centers for working moms and supported Title IX which prohibits discrimination in the funding of education and related programs. A reflection of Chisholm’s impact, 47 of the 127 women serving in the 116th Congress are women of color – the most ever. Her historic run for presidency was largely overlooked by the press and political establishment at the time. As the first woman of color to seek the nomination for a major political party, Chisholm called her odds “hopeless” but wanted to demonstrate the sheer will and refusal to accept the status quo. This determination has inspired a generation of women to seek local, statewide and national office so that women’s stories from both sides of the aisle are part of our country’s political narrative and our collective “table” is reflective of the depth of the American experience. Megan Fry is a shareholder and Department Chair of the firm’s Commercial Litigation practice group. 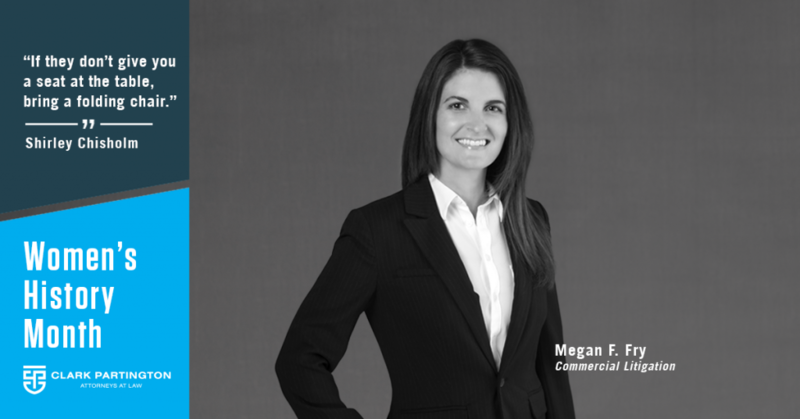 Megan’s practice focuses primarily on business and real estate litigation in state and federal courts in Florida and Alabama. She represents title insurers and their insureds, real estate owners, individuals and financial institutions in all types of litigation matters, including but not limited to, real property disputes, title liability and commercial real estate defaults. Her practice also focuses on business dissolution, shareholder disputes and general commercial litigation. Megan understands that litigation is stressful and approaches each case with the client’s goals for litigation or legal matter at hand and business needs in mind. Megan can be contacted at mfry@clarkpartington.com or 850-432-2180.